Vera: What happens when you get there? Cherie: What happens? Honey, you get discovered, you're tested... with options and everything! And you get treated with a little respect, too. 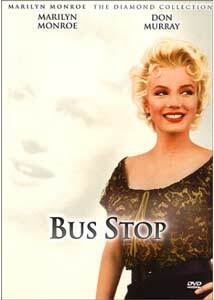 Bus Stop ranks as one of Marilyn Monroe's finest films. When I mentioned to my mother that I was reviewing it, she mentioned how much she enjoyed it and commented about how "they had made such fun of her when she tried to act." This is one of the most disturbing parts of the story of Marilyn Monroe. It always seems that the other side of the "much-loved" coin is the "most-belittled" side. Marilyn was criticized for building on her own success by breaking with the studio system and creating her own production company, adding approval of scripts and directors. She drew much ridicule by joining the respected Actors Studio and attempting to improve her craft. Bus Stop is one of the series of films that Monroe completed in the late 1950s and early '60s that are some of the most unique movies that Hollywood ever produced. In 1957, when the Academy Awards® for best actress were announced, the list included Ingrid Bergman in Anastasia, Carroll Baker in Baby Doll, Nancy Kelly in The Bad Seed, Deborah Kerr in The King and I,and Katharine Hepburn in The Rainmaker with Bergman the eventual winner. Now anyone can have their own opinion about what the Academy does, but, in this case, I would not trade away Monroe's performance in Bus Stop for any of these. In fact, the whole film was remarkably ignored that year, with only Don Murray garnering a nod in the best supporting actor category. Simply astounding. Bus Stop is the story of a naïve young cowboy, Beau Decker (Murray), going to the big city for the first time to compete in a rodeo. He meets and woos, in his own blustery fashion, a night club singer name Cherie (Monroe). The movie is a great romantic comedy that ranges from the slapstick humor of Beau's antics to the tenderly humorous give-and-take between Beau and Cherie. There is great energy between them and, despite the exaggeration of comedy, wonderfully effective dialogue. Monroe is a delight in her portrayal of the innocently knowing Cherie, who is following her "direction" from the Ozarks of Arkansas to Hollywood. After winning an amateur contest, she has ended up in Phoenix, Arizona, hustling drinks with cowboys and only grudgingly allowed to perform in a stage show that is hilarious in its awfulness. A memorable sequence is her performance of That Old Black Magic for the very unappreciative audience as she clumsily controls the lights herself by kicking switches. This is the scene where Beau first sees his "angel" and begins his single-minded drive to win her hand, which leads him to kidnap her bodily and take her on the bus with back to Montana. William Inge, who wrote the original play, Bust Stop, was close to Tennessee Williams and Arthur Miller in importance to American Theater in the 1950s. He also wrote such memorable plays made into movies as Come Back Little Sheba, Picnic, and The Dark At the Top of the Stairs. George Axelrod, who had previous success with the play and movie The Seven Year Itch, adapted Inge's play for the screen and does a marvelous job of transferring the much more static play to the screen. The supporting cast is uniformly excellent with veteran character actors Arthur O'Connell as Beau's friend, Virge, and Betty Field as Grace, the owner of the bus stop providing solid support to the stars. O'Connell and Field both appeared in the successful adaption of Picnic, starring William Holden and Kim Novak. Newcomers Eileen Heckart and Hope Lange add nice touches to the production. Heckart got an Academy Award® nomination in 1957 for her performance in The Bad Seed. Director Joshua Logan was a successful writer/producer on Broadway and directed several memorable films including Picnic, Mister Roberts, Sayonara, Paint Your Wagon and Camelot. He keeps Bus Stop moving at a frenetic clip early on and slows it down nicely at the end, allowing room for the actors to bring the story to fruition. There are only a handful of Marilyn Monroe's films that are absolutely essential. Bus Stop is surely one. With the quality of the production and the beauty of Marilyn's performance, this is a disc that will be reached for more than once. Image Transfer Review: Watching Bus Stop in its original aspect ratio in this anamorphic transfer, I truly felt like I was seeing the film for the first time. Goodbye to murky, grainy jumpy video and hello to the solid, crisp and colorful digital transfer. This will be a great disc to show to someone who has seen Bus Stop on TV and allow them to see what restoration and digital transfer of a classic film can mean. Audio Transfer Review: Bus Stop features a Dolby 4.0 Surround track in addition to regular English stereo and a mono mix in French. Despite the somewhat annoying folkish theme, The Bus Stop Song, by Ken Darby, the soundtracks deliver a satisfying aural experience. There is obvious care taken in dialogue placement in relation to what is seen on the screen and the spaciousness of the enhanced stereo is particularly evident in the outdoor sequences at the rodeo. This is another fine example of bringing a classic movie to the home theater environment. Extras Review: This disc contains minimal extras, even by the standards of The Diamond Collection. Beside the theatrical trailer and Restoration Comparison, the only material is three lobby cards and a post card. If ever there was a movie demanding a back story documentary, this is one. Featuring some of Marilyn's finest acting, Bus Stop is a must have DVD, both for its beautiful restoration and the quality of the film itself. Beautiful adaptation of William Inge's play by George Axelrod, wonderfully acted by a cast of newcomers and veterans and intelligently directed by the masterful Joshua Logan; this is one of the fine example of American film. Highly recommended.